We all know mi recently release MIUI version 10 in their many devices, Mi Redmi 5A also get the MIUI 10 updates, Miui 10 comes with better security and better optimizations and also get too many features, now too many users facing Mi Cloud lock in Mi 5A MC13B devices, so here we share with you a guide to Xiaomi Redmi 5A MC13B Mi Account unlock-MIUI 10, so follow this guide to Redmi 5A Mi Account Remove MIUI 10 very easily. Note:- This method we try on Redmi 5a (MC13B). You can follow this method on Redmi MC13B Mi Cloud Remove. Tools that you needed to unlock Mi cloud a Computer / Miracle Box 2.58 cr##k. -Then extract the downloaded Redmi 5A MC13B Mi Account Remove files to your PC. -Download all files below to Xiaomi Redmi 5A MC13B Mi Account unlock-MIUI 10. -In the last update, Mi has updated all the security patch level to a new level, MIUI has fixed all the old method that helps you to Redmi 5A Mi Account Remove MIUI 10 on your Redmi 5a /Redmi MC13B old security patch level. -After that, open the extracted Redmi 5A MC13B Mi Account Remove files. -Once opened then there you will see “Miracle 2.58 Crack.exe”. -Then there click on the “Qualcomm” tabs from there. -After that, go to “Extra” tabs from there. -Then on the “Extra” tabs check on below there you will see “Mi Account Remove” tab. 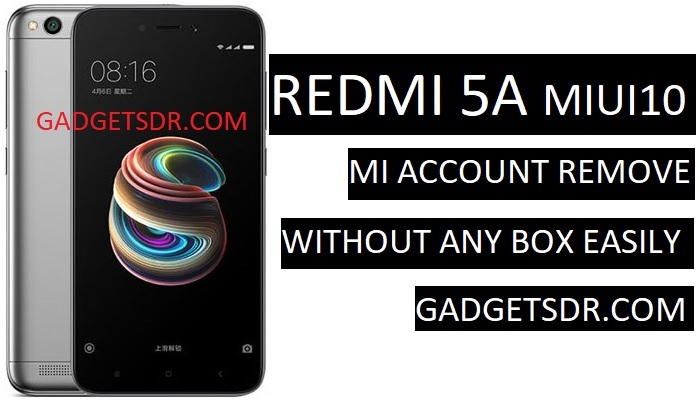 -Select the “MI Account Remove” tab and then there you will also get a “Drop down” menu select “Redmi 4A” model there to Successfully Redmi 5A Mi Account Remove MIUI 10. -Now you have successfully put your Redmi 5A in to EDL Mode to Xiaomi Redmi 5A MC13B Mi Account unlock-MIUI 10. -Once you see your device “COMPORT” version then open the “Miracle 2.58” tool. -Then click on the below “START” button. -Now wait 5-10min and do not click any other button while you try Redmi MC13B Mi Cloud Remove. -Reconnect your device battery and Power on your Device. -Once your device Power on successfully, then you will see your device Mi Cloud lock successfully removed. Thanks for visiting us, Comment below if you face any problem With Xiaomi Redmi 5A MC13B Mi Account unlock-MIUI 10 | Bypass Mi Account MIUI 10, we will try to solve your problem as soon as possible. you can check other some tutorial here to help you.